Nichola Feldman-Kiss refers to this mean body project as an "expanded performance of self-portraiture". It is a melding of traditional explorations of the figure with scientific research on the human shape…in this case her own toned physique. 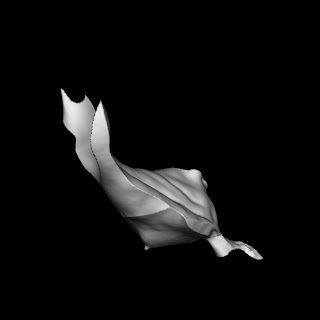 After training to obtain her desired body image Feldman-Kiss posed for a three-dimensional whole body scan. The resulting database consists of eighty-two three-dimensional data sets. These data sets were used to create representations of her body in a variety of media. The mean body project includes a video animation, a large grid of ink-jet prints, a group of plastic rapid-prototype sculptures, four back-lit transparencies, a very large professionally bound book of data, several small bronze sculptures and a contract licensing research rights to the data. Also included in this exhibition are large scale contour drawings generated from this same data. This exhibition, although routed in the technology used to generate the various components, draws reference to past traditions of self portraiture and previous scientific efforts to determine standardized body-shapes through more rudimentary body measurement data. It further explores how minor changes in the data can result in unfamiliar and almost eerie images barely recognizable as the human form. Kim Sawchuk, author of the text for the accompanying catalogue, refers to these components as uncanny. Her in-depth analysis of this mean body project touches on social and cultural issues associated with body type and the stereo typical images of the female form, of gender and power. As Feldman-Kiss herself notes, "I am interested in how the body has been measured historically, creatively, scientifically, anthropologically and how value has been attributed because of differences." "After training to obtain her desired body image"
well thank you for that....I mean who would go to the trouble of getting the (potentially immortal) 3D body scan of what isn't of desire. Now there would be a real show about something. Instead we got Narcissism 101. Thanks for your comments. It's great when viewers are not afraid to be critical. The 905er hopes you will give us your take on other exhibitions.